Children in America have been ripped from their parents and put in cages. The President has passed an executive order to supposedly stop the separations, but which actually allows for the indefinite detention of these families. There is no plan in place for reuniting the more than 2,000 children who’ve already been taken from their parents. The Trump Administration’s cruel and unnecessary “zero tolerance” policy remains in place. Here, in Vermont, we’ve passed policies that speak to a sentiment of making our state a “sanctuary”, which keep us from feeding into the hateful frenzy, and which provide aid and comfort to those seeking freedom and opportunity. Sign our petition that urges Gov. 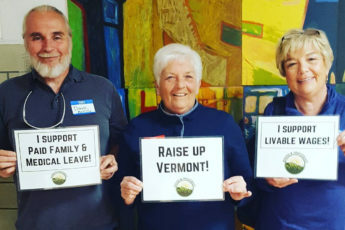 Phil Scott to ensure that Vermont does not in any way aid and abet this inhumane treatment of people who are seeking a better life in our country. Donate to one of the wonderful legal aid and immigrants’ rights groups working to unite children and families. Donate here. Join concerned citizens and activist groups rallying at the State House on Monday, June 25th at 6pm. Click for details. Join the Washington, DC Civil Disobedience Action on Thursday, June 28th. Click for details. Join one of the many direct actions taking place across the state on Saturday June 30th. Click here to find one near you. Call Sens. Patrick Leahy and Bernie Sanders and Rep. Peter Welch and urge them to fight the Trump administration’s egregious policy of indefinite internment and caging families in warehouses or on military bases. Share this People’s Action video footage of children being moved on commercial flights while down in TX. MSNBC released it.